Look at us. All bright, young and shiny. Solid potential all around. Nineteen kids. One teacher. That’s her at the back, Mrs. Arnold. And the Principal who appears to be wearing bunny ears thanks to that bunny on the bulletin board behind him. I don’t recall his name. I was with this group on the day President Kennedy was assassinated. Mrs. Arnold was our leader on that dreadful day, a day we couldn’t quite fully comprehend. I’d been a seasoned, even grizzled kindergarten veteran, but that wasn’t the same as first grade. Kindergarten wasn’t nearly as organized, or profitable. I mean we took naps! Naps, I tell you. Hardly a productive group experience, at least for me. I didn’t gain much clarity, but I do recall getting a bit of feedback. Accountability was always in place ’cause we were kids. And it was the 1960’s when adults believed in teaching us discipline. Not like today where the kids rule. Yep, I think it was a better time and I’m thankful to have been born in an era where kids were safe, but expectations were higher. Come on. Just look at us here. Okay, forget that kid on the right in the front row. He looks like he could enjoy spiteful behavior, doesn’t he. There’s power in a group, but it certainly depends on the group. Today’s show was sparked by a conversation I had some weeks ago with somebody about a group that I’m part of where accountability is pretty high. It’s a group where leadership isn’t bashful to serve the group. As we were talking I found myself reciting all the reasons why the group worked; why it performed at a fairly high level. That’s what I’d like to share with you today. I want you to think about your own situations, your own opportunities with whatever groups you’re a member of — and whatever groups you may be looking to join or form in the future. I don’t claim to hold any profound wisdom about this topic, but I’ve got extensive experience working with and forming high performing groups. I know how powerful they are. And I know how addictive they can be for the members, too. So let’s dive in. If there’s no common purpose, the group won’t be high performing. Kindergarten was a low performing group because we were just there doing time. Sort of like a fun kiddie prison. Okay, a half-day prison of sorts. With toys. And snacks. And naps. Every member of the group must know, understand and believe in why they’re together. I’ve posed it as a “WHY” question, but others would say it’s PURPOSE. Same difference. It’s quite simply the reason for the group to exist. Take something as simple as a coed recreational volleyball league. Players can be put together who never knew each other until their team was formed. The volleyball league is made up of teams of men and women who want to play volleyball. Let’s suppose this league has a rec division and a competitive division. The rec league is made up of people who just want to play according to the real rules of volleyball, but they’re more interested in having fun, getting some exercise and being on a team. The competitive division is more serious and the teams are more competitive, with each member having higher skill. That’s important because the teams – the groups – are comprised of mostly similar people desiring similar things. Have you ever been on a team where you wanted to really compete, but others were mostly just interested in having fun? It’s frustrating. I’ve coached many teams in my life and there’s always trouble when some don’t want to take it as seriously as others, or when others want to take it too seriously when that’s not the purpose of the team. So, purpose is very important. And it’s important that every member of the team understand why we’re together and what we’re here for. I’ll include the necessity for high performing groups to also be of similar ability and skill. That likely deserves it’s own heading, but I’m including it here in this first category because you’re not likely going to ever be able to assemble or be part of a group where everybody is identical in skill, ability or experience. The key thing is to make sure the disparity is small. That is, A players want to play with A players. Even in the rec league that’s true. A players will be fine with some B players, too. But insert a C player or two and you’ll instantly make the A players annoyed and frustrated. C players need to step up to become B or A player if they want to be part of a high performing group. Otherwise, I don’t think they have a home. Few things destroy the effectiveness of a group more than a disparity of purpose. Now this isn’t the same thing as – some are here for one thing and others are here for different things. The recreational volleyball players know why they’re on the same team. They don’t want to have their nose broken by a spike. They want to play legitimate volleyball where lifts and net violations are called (accountability), but they mostly want to compete in a less competitive stress-filled league. One wants to do it for exercise. Another wants to do it to improve in hopes of eventually moving up to the competitive league. Another is mainly there so he can play a sport with his wife. Each person may be getting something specific out of it – something they want and need – but they all know why they’re together as a rec team. If just one player is a wannabe Olympian, then there’ll be trouble. He’ll be taking things far more seriously than the rest. At every lost point he’ll rant and holler at teammates. He’s out of context with the purpose of the group and he’ll negate any joy the rest of the team might otherwise have. It’s important that players get placed on the team that best fits the purpose of the individuals. A. To play purely for recreational purposes where winning isn’t nearly as important as just playing. B. To play as competitively as possible. Two different reasons for each group. Urgent that every roster be made up of players who know why they’re together. This is the fragility of team chemistry. It’s where it starts. I’ve seen many personality conflicts erupt because team members don’t share the same purpose. In every high performing group I’ve ever been a part of, everybody knew precisely why we were together and what our purpose was. This includes “buy in,” that proverbial mental consent that joins people together to chase something in the same way. How Committed Are We To Do This? It’s one thing to know why we’re together, but that doesn’t mean everybody brings the energy necessary to get it done. High performing groups are committed — to a man and woman. Nobody is left behind on the Commitment Train. Everybody is on board. Think of the times when you were part of a group that had high performance potential, but something went awry. It could have been any number of things that disrupted the performance of the group. I’ll almost guarantee you that among any other problems the group may have faced, this one was most certainly right at the top. Not everybody was willing to put in the work, make the sacrifices and commit themselves to getting it done. Remember, we’ve already talked about A, B and C players. So at this point we’re assuming that the group is comprised of people who belong together. But I should inject something right here — a C player who is at that level due to inexperience or even a lack of talent can play nicely with the group if he’s fully committed, putting in the work and the group is seeing improvement and contribution. It’s context. High performing groups appreciate the hard working, lesser experienced person who know their place. They don’t appreciate the C player who seems convinced they’re an A player. Likewise, the AAA player who won’t work hard, who feels entitled and special will destroy the group. No amount of talent will overcome the group’s expectation that everybody bring value. While every group can easily recognize the difference in each member, there’s an equality that is expected. There are minimum standards established by leadership or the group that everybody must meet. When those aren’t met, commitment is appropriately questioned and peace gets disturbed quickly. Nothing can replace commitment. Talent won’t. Experience won’t. A title won’t. Let’s talk a bit about motivation. We’ll define motivation as the energy we all bring with us to do the work. That’s different than inspiration. I may be able to inspire a person’s motivation, but I can’t give somebody energy they don’t have. It’s like a battery. The battery can have full energy, but if the connections are bad…nothing happens. The energy is there, but it needs direction. Connection. Inspiration might include some education to help a person connect or tap into their inner energy, but their “battery” level is something they’ve either got or they don’t. This is important because high performing groups need everybody to consistently show up with the energy to do the work. You’ve seen this destroy a group. Somebody is always suffering some issue. Maybe they’re always running late, filled with excuses. Or they’re sick all the time. Or they’ve got drama in their life that they’re intent on sharing with the group. Everybody thinks they could bring higher value, but sooner than later the group learns to not rely on them because they lack consistently. Every questions their commitment – rightfully so. Who cares what potential good they might bring to the group? Potential doesn’t accomplish anything. The group will grow increasingly disgusted with them. Every single member of the group must bring the energy and determination to contribute. High performing groups won’t tolerate selfishness. Peace is disturbed by this one awful trait. Selfishness. The group is what matters. Members know that they can only get what they need and want through the group. Let’s go back to our volleyball team. The person who wants to exercise weekly with his wife is getting something specific and different than the person who wants to improve so they can eventually play at the more competitive level. Yet neither can get what they want outside the context of the team. They need the team in order to get what they want. Suppose they put their desires before the team. How is that going to work? It isn’t. It’ll wreck the team and their chances to have the team serve them. More importantly, it’ll rob each of them of the opportunity to serve the team! Everybody loses. And it happens all the time. Team members can’t get their attention off themselves. They’re desperate to want what they want and they don’t care about anybody else. They behave as though the group is there to serve them and they have no responsibility to serve others. It’s the single most destructive behavior of any group – high performing or otherwise. I’ve never seen a group perform at high levels consistently where there was no peace. I’m not talking about respectful conflict and debate. That can be quite profitable if members will behave appropriately, respectfully and with the intent of making the work better. It will be destructive if it’s self-centered, full of ego and lacking respect for the overall performance of the group. It’s borne of that “I’m gonna look good even if you guys all look bad” kind of philosophy. High performing groups can’t and won’t tolerate it. Great groups check their ego at the door and refuse to let their own (or anybody else’s) interfere with the overriding reason for their existence together. Sometimes it means sacrifice. It means we submit to the group’s decisions and well-being. It means the idea we think is best may have to be tabled because the group desires something else. There’s a time to speak and a time to sit quietly. Our level of selfishness often determines which is appropriate. Another part of this is our ability and willingness to serve others in the group. The less selfish we are the more we’re likely to gain. Suppose you’re on a volleyball team of 9 people. There are 6 people on the court at any one time. That means 3 people are sitting on the sideline, if everybody is there. The selfish player can think, “I should be out there. I’m better than him.” If he continues to think like that he’ll act that out eventually. But he could decide to cheer and encourage, staying upbeat and ready when he does go into the game, determined to be the very team mate possible. It’s an enormous difference in behavior sparked by how players think. Consider how the team will behave toward those two different approaches of a player on the sidelines. If you’re on the court do you want to surrender your spot to the pouting, I’m-better-than-you teammate? Not likely. The high energy, cheering, encouraging teammate who is excited for those on the court…would you like to see him get some playing time (remember, he’s fully capable of playing at your level, that’s why he’s on your team)? Sure. Most of us will gladly share our time with a guy like that because he’s serving us. It’s more than an attitude. It’s behavior. Without exception, every high performing group I’ve been a part of, or the ones I’ve watched from the outside, have a pride in the group that is without question. They’re filled with pride to be part of the group. They’re proud of the accomplishments of the group. Proud of the growth and the opportunity. There’s something exclusive about high performing groups. It’s special. And addictive. It’s manifested in how much time people spend together. I’ve run organizations where people stood in the parking lot for long periods of time talking, brain-storming and telling stories. I’ve coached teams who did the same thing long after practice had ended. There’s a reluctance to part. There’s an attraction to stay together. It’s a bond that I’ve learned many people have never experienced. That’s sad to me because these are special times when we’re part of something that brings us such pride. Pride can fuel greater commitment and discipline to make sure we’re earning our keep. It’s not an arrogant, I’m-better-than-you kind of pride. It’s a feeling of gratitude to be able to contribute to such a group, and to be part of it. We want to maintain our inclusion in such a group. 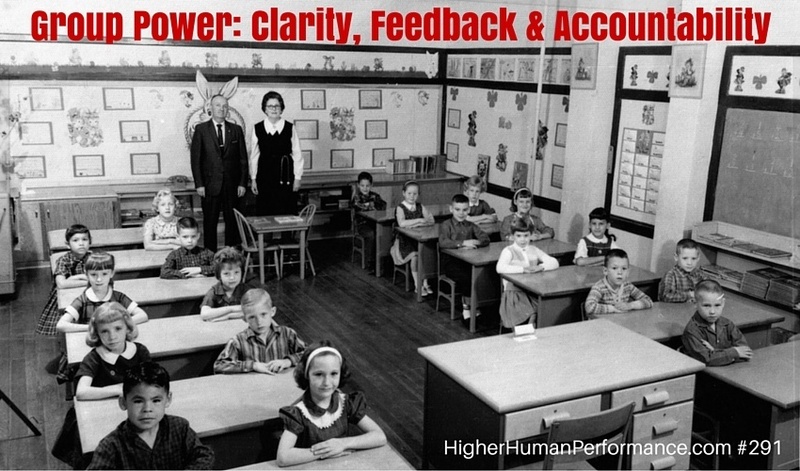 What About Clarity, Feedback And Accountability? I think by now you can see how clarity happens. High performing groups are quite clear about their why or purpose. That drives their ability to be clear about how to get things done. Feedback is valued and encouraged because without it clarity is lost. Without it, improvement is stopped dead. Where there is no accountability, there is no high performance. It’s impossible. Expectations have to be established and met. When they’re not, what’s the repercussion? There isn’t one? Then the group isn’t high performing. It’s got nothing to do with whether a member is an A player or a B player. The stars on the team need higher accountability because they’re able to contribute more. Every member has to be expected – and required – to bring all they can to the benefit of the group. If the group tolerates your willingness to bring anything less, then why should I put forth my best? Accountability isn’t a dirty word. It’s vital and craved by high performing people comprising a high performing group. The best people want high accountability. Slugs don’t. They resist it. As I was talking about a specific high performing group with a friend recently all these components were part of the discussion, but accountability was a real focal point. Mostly, because it’s so rare. People talk about it, but few people do it, or experience it. I’m not talking about a calling on the carpet. I’m talking about real, legitimate positive accountability. I’m talking about maintaining a high expectation. We’ve all experienced getting in trouble. That’s not what this is although it might include it when it’s deserved. Mostly, it’s manifested in not letting people off the hook for a less-than-you-can-do job. It’s not expecting the B player to perform at an A level. It’s expecting the best that we know the B player can deliver. It’s accepting nothing less for the good of the person, and the performance of the group. It’s a service thing. Not a punitive thing. That doesn’t mean it can’t involve some punitive measures if they’re required, but that’s not the purpose. The purpose of accountability is to elicit the very best of each member so the group together and soar as high as possible. It’s a teamwork thing. Each group member deserves to be held accountable. Otherwise, they become unfit for the group. How is that fair? Everybody deserves to perform at their highest level. To allow otherwise is to lose confidence in each other, to lower our expectation for each other — and to be willing to put our group at risk. Again, that’s unfair to all concerned. Some people think that high performing groups just happen, or they don’t. They think it’s a serendipity thing that can’t be created or controlled. WRONG. I’ve heard people, including sports team coaches, talk about team chemistry as being this ephemeral, fragile, hard to predict kind of thing. It doesn’t have to be. I don’t think it should be left to chance or happenstance. Still I often hear leaders hoping to capture it. They approach it like a search for a 4 leaf clover. The odds aren’t great, but it could happen. Such leaders aren’t prepared to lead a high performing group in my opinion. They’re not strategic or intentional enough to deserve to lead such a group. And a high performing group deserves better leadership than that. The world is full of examples of leaders or coaches unable to assemble a winning team. Chip Kelly has been a colossal failure in Philadelphia even though he’s been empowered to pretty much have things his way. I’m not qualified to second guess NFL professionals, but it’s easy for anybody to see that what coach Kelly is doing and has done, isn’t working. Fact is, it’s not working spectacularly! On the flip side look at the Carolina Panthers of the NFL. Last season was a lackluster affair. This year, they’re leading the league. Watch them play and you see they’ve got something special. I don’t know, but I’m willing to give credit to their leadership for helping make that high performing group come together. If you’re a leader, put in the work to assemble the best group possible. Be devoted to making sure these ingredients are in place. Don’t short cut it. Don’t accept mediocre or excuses. Make it happen. People are craving such groups. They want to be part of it and they won’t want to let it down, or be ejected from it. It’s why in too many cases the rich get richer and the poor get poorer. Top performing people who aren’t yet part of such a group long to be part of one. They’ll line up to be part of yours. Case in point, the top college football programs continue to be the top programs year in and year out because the best high school football players want to be part of a winning program. Recruiting is easier when you’re leading a high performing group. It’s also a whole lot more fun. Next post: 292 Leadership: Should You Be A Lone Wolf Or Part Of A Pack?